This advanced backup solution is designed for managed service providers (MSPs) who are serious about selling a robust offering, and looking for granular control functionality. Our solution includes backup of virtual machines, servers, desktops and laptops. Re-brand this client-server based and cloud backup solution in your own corporate identity and impress your clients by providing them with a secure, managed backup service for all their IT needs. 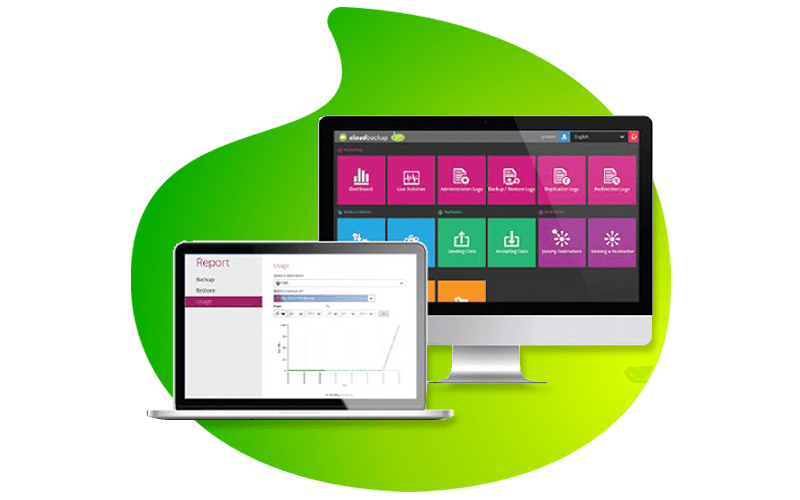 Access to your own provisioning and management portal gives you the ability to offer your clients a secure and managed solution. Monitor all aspects of the health of your clients’ backup solutions at a glance, giving you time and visibility for troubleshooting. Create new accounts simply and quickly with our Windows AD integration system. Our group policy management feature is geared for customised user policies. We’ll help you win over clients by supporting an unlimited number of trial accounts. Plus, we won’t charge you for license usage. Choose between local drive, mapped network drive, FTP / SFTP server, and public cloud object storage. Administrators can add as many destinations as required. As your client list grows, we can easily scale up your whole backup system by redirecting extra user traffic. Enjoy near-instant replication, configured retention policies, established traffic limits, redirection and redirection logs, multi-destination backups… and the list goes on. CloudBackup MSP is a hosted and fully managed CloudBackup Server service that will alleviate your hassle to setup your hardware to host the cloud backup. You will in turn manage your own clients from the Centralised Management Portal hosted in the Vox cloud environment. Your initial one-off setup fee will cover your portal setup and administrator training. Additional storage space, as well as the corresponding licenses you need will be on a month-to-month consumption based operating expense. This end-to-end pay-as-you go offering, is ideal for MSPs who intend to start their online backup service for a small number of clients in a very scalable manner without the initial and ongoing infrastructure investment required for your business growth. Does CloudBackup include monitoring and support? CB MSP only covers the monitoring of the underlying infrastructure and hosted CloudBackup Server and not the monitoring of end users, that is the responsibility of the client (MSP). The service excludes the daily operation such as create backup sets and Move/Add/Delete user operations. Vox offers the MSP 2nd and 3rd tier client support, however the 1st tier end user support is the responsibility of the MSP. What redundancy does Vox offer me should the cloud server experience downtime? We’ve built in replication for immediate replication of backed up data and backup server settings to another standby CloudBackup Server This enables us to ensure minimal downtime and data loss avoidance. Once the data has been backed up the replication will be triggered almost instantaneously, so when the corresponding server is down, the replication server can be quickly converted into the primary server to keep serving backup users. How secure is my customer’s data? All customer data is stored within South African borders and replicated across Vox’s multiple data centres ensuring that your customers comply with any data sovereignty issues and minimal latency. Customer data is further secured at rest and in flight with our software’s randomized 256-bit AES encryption to ensure no unwanted eyes ever intercept your data. For enhanced security our system also supports SSL for secure transmission.